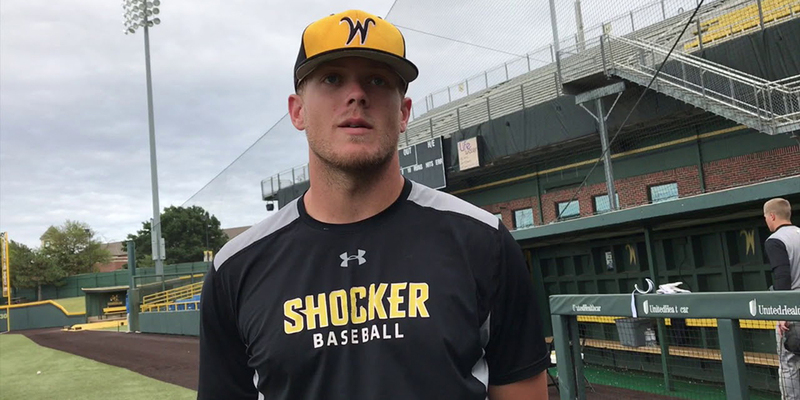 The next prospect in our draft profile series is a gifted hitter with some versatility, Greyson Jenista out of Wichita State. The first thing you’ll notice about Jenista is that he’s already got a major league body. At 6’4, 240, Jenista measures in at the same height and 30 pounds heavier than Cody Bellinger. The comparisons to Bellinger don’t end there, as Jenista has played all three outfield positions and first base in his time as a Shocker. Jenista has a quick-yet-powerful swing from the left side, and it’s easy to see him become a legit power threat at the plate. Jenista came out of the gates as a freshman at Wichita, posting a .326/.431/.471 triple slash line with five home runs in 206 plate appearances and was named a second-team Freshman All-American by Baseball America. Concerns arose, as he struggled in the Cape Cod League with a .229/.301/.321 line. He bounced back in a big way as a sophomore by adding some pop with a .320/.413/.509 triple slash and nine home runs. He returned to the Cape Cod League and took home league MVP honors with a .310/.391/.401 slash line. He showed improved plate discipline as a junior, posting a .309/.446/.475 triple slash with nine home runs. As a freshman, Jenista walked 31 times and struck out 27 times. His increase in power in his sophomore year came at a cost, as he walked 32 times and struck out 47 times. As a junior, Jenista drew 50 walks and struck out 41 times. In his three years in college ball, he struck out exactly one more time than he walked. Jenista also went 12 for 13 in stolen base attempts as a junior, showing added speed after stealing only eight of 15 bases in his first two years of college. He isn’t as fast or athletic as Bellinger, but can still handle his own in the outfield. He probably isn’t suited best to stick in center long-term, but he should be playable in left field or right, or at first base. Videos courtesy of Fangraphs, Baseball America and Brandon Schlotfield. I threw the Bellinger comp on Jenista earlier. That mainly applies to body-type and positional ability, as Jenista’s swing is nowhere near as violent and powerful as Bellinger’s. He might be a bit better at making contact, but it remains to be seen whether his strong body will translate his raw power to game power. He might be a little more in the Eric Hosmer lane as far as the offense goes. He’s shown improvements in power and speed in his three years of college ball, so a bit of seasoning in the minor leagues could unlock even more potential. Fangraphs’ latest mock draft projects him going one selection before the Dodgers’ #30 pick, so there is a chance he’s on the board for the Dodgers.